President Nana Addo Dankwa Akufo-Addo, has re-opened the Anglogold Ashanti gold mine in Obuasi, which had been closed since 2014. 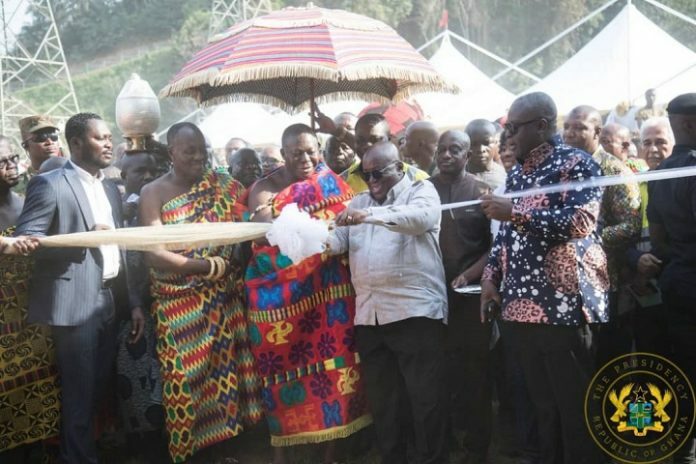 Addressing the Chiefs and people of Obuasi, on Tuesday, 22nd January, 2019, Akufo-Addo noted that upon his assumption of office, a series of discussions and negotiations took place, the end-result being the re-development project of the Obuasi mine. With an estimated two thousand, five hundred (2,500) jobs to be created, he was confident that Obuasi, a once vibrant town, will be brought back to life again, with an improvement in the living circumstances of its residents. Additionally, President Akufo-Addo noted that Government is expected to rake in some US$2.16 billion in revenue over the next twenty-two (22) years, in royalties and corporate and withholding taxes. “I assure management and staff of the mine that the sequence of events that led to the closure of the mine will not recur under the watch of this Government. The days of forceful encroachment on the concession of the company, as witnessed between 2010 and 2016, are over,” he added. Touching on the “distressed state” of Obuasi, the President indicated that the time has come for Obuasi to reflect the fact that it hosts the richest gold mine in the country, and one of the richest in the world. Whilst acknowledging that mining companies have, over the last few years, complemented some of the work of government, he was expectant that Anglogold Ashanti will do more this time to help transform Obuasi, and bring it to par with well-developed mining communities in other parts of the world. “When Government and mining companies collaborate in an intelligent and sustainable manner, more can be done to transform mining communities. I have no doubt that Anglogold, under its current management, will be a constructive partner in this journey,” President Akufo-Addo added. On the lifting of the ban on small-scale mining, he indicated that, with a considerable degree of success, Government has been able to streamline and regulate the small-scale mining sector. “We are determined to ensure responsible mining, and I appeal to you, Nananom, to help Government in securing for future generations a landscape and vegetation on which they can also survive and thrive. I am happy to say that, today, people are fishing again in one of the famous rivers of our country, the Ankobra,” the President said. As captured in the 2019 budget, he told the Chiefs and residents that the contract for the construction of the Obuasi-Anhwia-Nkwanta road has been awarded to Joshob Construction Limited, who is already on site working. “Again, Government will soon accept the Assets Relinquishment Plan of Anglogold Ashanti, which will pave the way for the start of the proposed Obuasi Campus of the Kwame Nkrumah University of Science and Technology,” he added.